An assortment of Orcs – mostly old Games Workshop/Citadel figures that I’ve had for ever… stripped of paint in recent years and now finally repainted. The Big ‘un…? I’m not sure where he came from. I think I got him in a trade…? All the Orcs I have for my Orcish Dragon Rampant warband. That’s two units of Bellicose Foot and a unit of Light Missiles. The giant is not a really HUGE giant, perhaps I could call him a single figure unit of Bellicose foot…? I have two more 12 figure units of Bellicose Foot and another Light Missile. 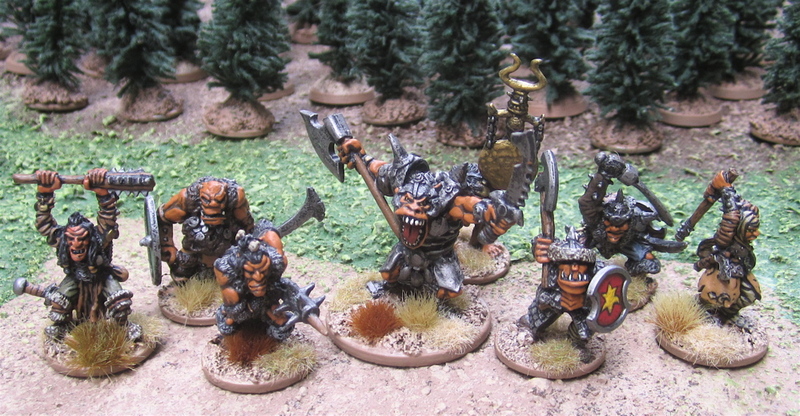 I also have a five more trolls (to make up a 6-figure – reducded figure – unit of… something…? More Bellicose Foot, perhaps?) and a few more big orcs to make a 6-figure unit of… something…? STILL MORE Bellicose foot!? I don’t know… Just trying to organize things into 6s and 12s. haven’t given a whole lot of thought as to how to field them. I’ve been back and forth on what to do over the summer – miniature-hobby-wise – I am defninitely going to be working on all those jet bikes… but I’m a little torn as to what else to work on. I have units for all the Dan Mersey rules I’d like to finish up (one unit of Mounted Men-at-Arms for the Green/Yellow Retinue, A few units of Fierce Foot for the Medieval Irish retinue, an entire retinue of Black & Blue generic medieval types, and the Saracen and Teutonic Knight retinues for Lion Rampant, Orcs and Dwarves and Elves and Halflings for Dragon Rampant, British, Zulus, Martians, Boers and an assortment or European colonilal types for The Men Who Would Be Kings, and a bunch more Scots, Irish And Englsih for The Pikeman’s Lament). Plus a few other things possibly for A Song of Blades and Heroes or Fear and Faith or Song of Shadows and Dust or Mutants and Death Ray Guns or similar games or for Role-playing games I hope to run later in the year. I backed the Astropolis II Kickstarter but that won’t be arriving until August. Hopefully LATER in August so it won’t prove too much of a distraction while I’m trying to finish up jet bikes!! I also hope to get in a lot my RIDING! You could take the 6 most crazed-looking orcs and create a berserker-style forlorn hope unit (or whatever Dragon Rampant terminology has for it). That would give you a little variety perhaps? I think Forlorn Hopes are kind of like Elite Foot in Dragon Rampant. That's not a bad idea! Don't forget the bomb with a lit fuse. I have quite a collection or orcs and goblins amassed over the years, but I've painted them all green. I like the look of your reddish/orangish ones. They look really good! You've inspired me a bit. I might just paint (or repaint) some of mine in colors along those lines, as a different faction. Although, for now, I have plenty of other minis on the painting desk and in the off-desk queue. More sci-fi figures, and then more dwarf musketeers, as well as some odds and ends. The orange horde looks great!